A model of financial markets based on the Ising Model. The agents are given two possibilities: To buy or to sell a given stock. Each agent is influenced by the price as well as its nearest neighbors. The conflicting character of a minority game combined with a ferromagnetic Ising model causes frustration across scales and emerges expectation bubbles and volatility clustering known from real markets. Scientists suggest ideas to each other and accept those new ideas with a probability proportional to their popularity. Once a scientists has scrapped an idea he cannot reconsider it. An innovation rate controls how often scientists come up with new ideas. This is a minimal model of how epidemic spreading interacts with immunity of individual hosts: Every agent only gets infected once by each disease. Older diseases thus face a harder time while new diseases sweep over the system. 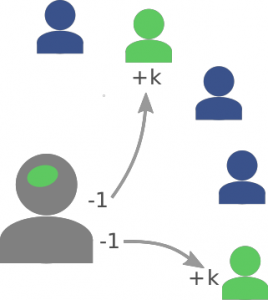 This is a simple neural network model which exhibits self-organized criticality (SOC). Based on local rules only, the network evolves towards criticality, showing typical scale-free avalanches matching those recently observed in the brain. S. Bornholdt and T. Rohlf, Topological evolution of dynamical networks: Global criticality from local dynamics, Phys. Rev. Lett. 84 (2000) 6114-6117. S. Landmann and S. Bornholdt, Self-organized criticality in a binary neural network model with local rules, Verhandl. DPG (VI) 52 (2017). This implementation features more plots, higher dimensional lattices, CSV export, downloads of animated GIFs, upload of initial states, export of the current state (JSON format) and more.